Hot Shot's Eagle stretch fleece touch glove features gunn-cut finger construction for easier grip, stretch fleece palm, fingers and panel on back of hand, touch silicone print on palm, index finger and thumb, fleece nose wipe on back of thumb, and a 95% polyester/5% spandex cuff. 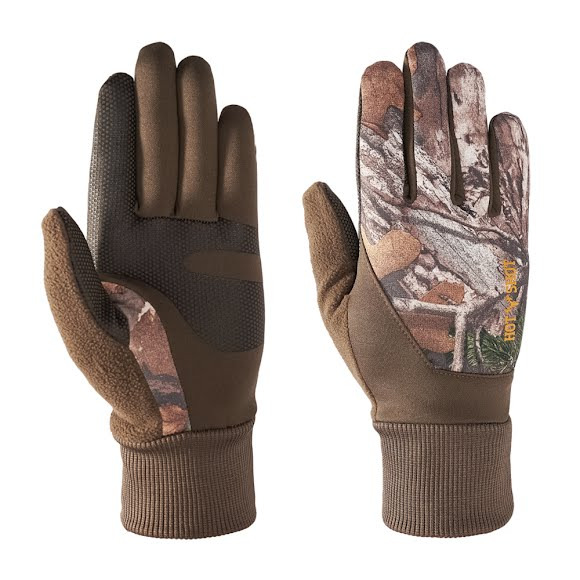 Hot Shot &apos;s Eagle stretch fleece touch glove features gunn-cut finger construction for easier grip, stretch fleece palm, fingers and panel on back of hand, touch silicone print on palm, index finger and thumb, fleece nose wipe on back of thumb, and a 95% polyester/5% spandex cuff. Hunting comes with a lot of challenges. Being confident you&apos;re concealed shouldn&apos;t be one of them. Introducing new Realtree EDGE™, the first camo pattern that allows you to blend into your hunting environment at close range, with natural elements arranged in a way to disrupt the human form at a distance.